Posted on November 8, 2012 by Greg Kaz. The types of elastomeric coatings and uses of them are numerous. Here you can learn a little bit about each type and the purposes for which they are most often used. A modified asphalt coating consists of asphalt and rubber-like polymers. 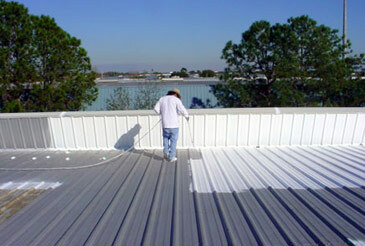 This material is most often used on roofs, although there are a few other applications. It is not suitable for sealing driveways or for covering other asphalts, as it does not adhere directly to asphalt. There are several disadvantages of this material. It is only available in black, which absorbs and transfers heat, making the building hotter if it is used on the roof. Softening and deterioration occurs over time due to exposure to solvents, grease and UV light. There are several categories of polyurethane coatings. They are used to cover spray-foam, wooden decking and other building materials. None are exactly waterproof, although they do help to prolong the life of wood by preventing rot. Aromatic polyurethanes are one type. The disadvantages include discoloration and chalking over time. They are often used as a base coat for other polyurethanes, although when used as a final coat, the appearance is initially pleasing. Modified and single component polyurethanes are also available. Silicone types of elastomeric coatings and uses are limited. They are recommended in situations where “breathability” is desired. Moisture vapor can pass through the coating. Silicone is not compatible with other materials. For example, an EPDM coating will not adhere to silicone. Since the coating allows the passage of water vapor, it is not recommended for roofing or similar applications. Neoprene is a type of synthetic rubber made by DuPont. The coating is fast drying and retards vapors, but a top coat is required when the coating is used on exterior surfaces. Thus, there are numerous limitations to types of elastomeric coatings and uses of them. Hypalons are another type of synthetic rubber also made by DuPont. The Hypalons have more applications than the Neoprene material. They can be used as fire retardant and waterproofing agents. They are often used in roofing and for coating tanks and coolers. The Hypalons are compatible with other coatings and can be used on top of many of them, but it is necessary to check with the manufacturer about that. Butyl rubber is the most water resistant coating, which makes it a good choice for applications that are very wet or very cold. The coating is often used in coolers, freezers and cryogenic storage units, water storage units, ponds, pools and roofs. There are limitations of this type of coating. It can be damaged by hail, foot traffic or flying debris. It has a tendency to become chalky and is more sensitive to weather than some of the other options. EPDM is yet another type of synthetic rubber. It has the widest range of applications and the highest compatibility with other materials. Only asphalt and silicone cause problems with adhesion. The coating can be used on those surfaces if an undercoating is used. Flame retardant materials can be added to EPDM if fireproofing is desired. The UL listing on the manufacturer’s label will reveal the fire resistance of the coating. EPDM is often used in roofing as a waterproofing agent. It is long lasting when exposed to weather and can serve as a top-coat with no additional treatment. EPDM is among the best types of elastomeric coatings and uses of EPDM are nearly unlimited.